Ahead of the 2015 presidential election, Third Republic governor of Anambra State, Dr. Chukwuemeka Ezeife, has said a presidential aspirant on the platform of the All Progressives Congress, Maj. Gen. Muhammadu Buhari, is no match for President Goodluck Jonathan. Ezeife said he was certain that the President would defeat Buhari in 2015 with a wider margin than he did in 2011 – if the retired general emerges the presidential candidate of the APC. Jonathan has already been adopted as the presidential candidate of the ruling Peoples Democratic Party while Buhari, who was the first runner-up in the 2011 presidential election, is one of the top contenders for the APC’s presidential ticket. Ezeife told our correspondent on Tuesday that none of the presidential aspirants on the platform of the APC can defeat the President in 2015, and added that Jonathan had divine backing. “There will be no contest. 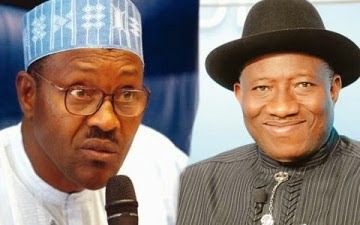 Buhari is no match for Jonathan. This is a clear case. Look at how Ebola ended in Nigeria. They are still battling with it in America. Look at the level of development that is going on. The man (Jonathan) always acts as if he doesn’t know what he is doing but he will be doing everything right. Ezeife, however, expressed worry that Buhari’s statement may lead to post-election violence if he loses the February 14, 2015, presidential election.